Watchmaking is full of terms and expressions. One of those terms is "keyless work". I can’t remember how many times I’ve pondered this term and its meaning. Until today, when out of a clear blue sky I suddenly realized it means the mechanics of a watch movement that enables us to wind it without a key. I’m sure this technology was revolutionary when it was invented. No more misplaced keys that would make our precious timekeeper stop. Perhaps the above is perfectly obvious to the English speaking members, perhaps even all members, with me being the (slow) exception! I have not heard of this term in the Russian language. Not that it isn't. Is applied in another case. Watch "Vostok", a great choice. I apologize if this question has been asked and answered already but several searches here and in the main /f10 forum yielded no results for me. I'm looking for the thread or section on "How To: Mod Vostok Amphibia." I am new into the world of Russian watches... And almost all the watches. Have read some of the threads about them and it is fascinating. 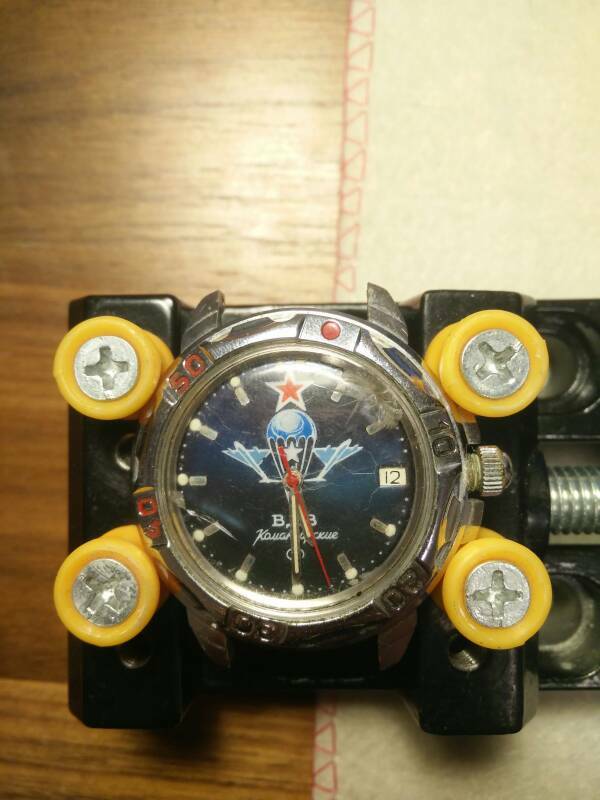 While rummaging in a market in Shanghai the other day I picked my first Vostok Komandirskie in a pretty good shape and really cheap. I was troubled at the beginning about the crown but then I found this thread and all the information is amazing. Watch is keeping good time and everything seems to work as intended. I might service it in a near future just to get to know the machine and make sure everything is in order. However I would like to ask you guys for some help. I would like to know if there is a way to know the production date (+ / -) and the case number. I am thinking about modding it and would like to buy the right parts. Any help will be highly appreciated. (---)I would like to know if there is a way to know the production date (+ / -) and the case number. I am thinking about modding it and would like to buy the right parts. Any help will be highly appreciated. I'm guessing case number 43. For example, take a look here. I would expect that some of our expert comrades in the "Q&A Expertise thread: Is this watch legit or a franken? Part 2" should be able to tell you the production date. As far as I know, any hands and dials made for any Komandirskie/Amphibia having a 24xx movement should fit. When it comes to bezels I can't really tell, but I'm sure some other knowledgeable member can enlighten us! Well, this is an excellent thread, and you can also browse the "Vostok Mod - the Revival" thread. Good luck! Hi Everyone - after using this great forum on and off for a while, I had to take the plunge and finally register. I've always liked watches but never really considered myself an enthusiast. I guess that changed when I recently told my partner that I was buying a new watch and her reply of 'what do you need another watch for?' changed my opinion of myself. We both had a chuckle. I only have a few cheap watches at present (none to write home about) though I recently picked up a Seiko 5 SNK809 which I absolutely love and has now led me on to buying more automatics. So anyway, I've just fallen in love with the great retro styling of the Vostok range and went ahead and bought a blue Scuba dude Amphibian Classic 420059 from Meranom. The history behind these and the quirks just really stood out and while I actively stay away from polished cases, I couldn't help myself on this one. This leads me onto my questions. From what I can gather from my research is that the bezel is very shiny (I know it's plated brass) which I think isn't going to sit too well with me. I don't mind the case being shiny as long as the bezel is either swapped out for a black/aluminium one or I find a brushed steel option. I've been trawling the web trying to find a brushed steel bezel and can't find anything. I did find the ebay seller dr.seikostain had a nice looking brushed bezel but it looked a little aggresive for me! It's also out of stock however. Meranom do a brushed version of the stock bezel that is shipping with my watch which I quite like, though it looks a little rough in the finishing? Sorry I can't post a direct link as this is my first post but it's located in the Amphibian Classic/Spare Parts/Bezel 42 Brushed section on their site. Has anyone had experience of this particular bezel? My other question is about the crown. I asked Meranom if the crown on my watch was steel and they said they now were. I'm assuming they used to be plated like the bezels? I don't really have an answer for your question about the brushed bezel, however, you can always go with one that accepts a bezel insert. Check out Dagaz Watch; they sell the bezel and tons of bezel inserts. As for the crown, I believe they are still brass with a stainless steel outer shell. You do have the option to purchase the all stainless steel crown. Not only does it look better (in my opinion), it's easier to grip and wind your watch. I removed the red paint from the indexes and I want to paint them blue, but what can I use? I was thinking about nail polish, but maybe there's a better alternative.